The monitor comes with a bundles soundbar which has been made keeping gamers in mind. Early last year Nvidia and its partners announced the Big Format Gaming Display (BFGD) initiative with the goal of bringing TV-sized 4K gaming monitors to the market. TVs tend to have a very high response time — the image takes too long to render — when compared to gaming monitors. Nvidia's initiative has resulted in TVs that support low response times and HDR, as well as native support for Shield TV, Nvidia's Android-based home console. The displays were expected to arrive in summer of last year but never came. The first display is now set to arrive in February 2019, and it's called the HP Omen X Emperium. As the name suggests, it's part of HP's Omen gaming lineup. 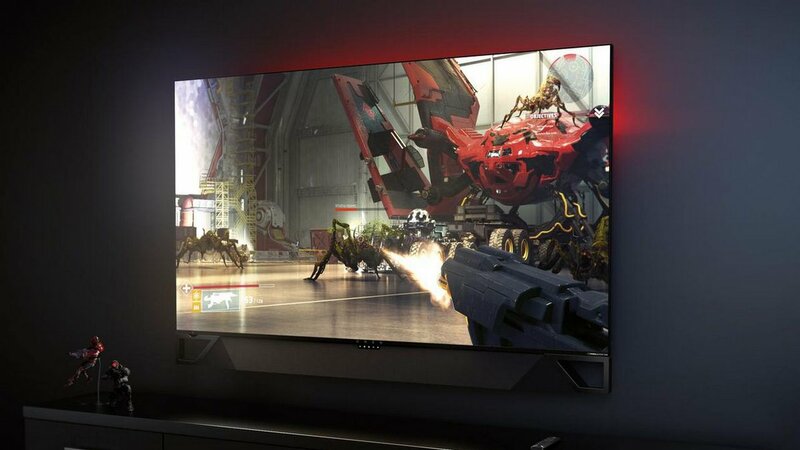 The Emperium is a 65-inch 4K HDR gaming display with a refresh rate of 144 Hz and is G-Sync compatible. G-Sync is an Nvidia-specific technology that reduces visual tearing when rendering fast-paced scenes. The display gets Nvidia’s Shield integrated, which ensures that users have access to streaming games, apps like Netflix as well as Google Assistant. This lets you use this monstrous display as more than just a big, gaming monitor. That's not all. Another key selling point of the Omen X Emperium 65 is a bundled soundbar designed with gamers in mind. HP claims that the soundbar is rated for 120 W of output power and sports three stereo amps and Low-Frequency Array (LOFAR) technology to avoid the need for a subwoofer. The soundbar can switch between two modes — one tuned for gaming and another for general entertainment. There are a couple of nifty features thrown in by HP here as well. The display features special sensors that detect a user's hand and lights up the ports when required. There's also adjustable RGB lighting on the back, which is a common feature on any of HP's Omen line of gamer-oriented products. As per a report by The Verge, the Omen X Emperium will be priced at a whopping $4,999.